Romeo y Julieta cigars have always been among the world's most flavorful and reliable cigars, so why not match your Romeo's up with an equally reliable cigar travel case, like this 5-cigar model by Xikar that features the Romeo Capulet, Montague and Verona cigar logos - all exclusive to Famous Smoke Shop. The durable, airtight case is weather and impact resistant, while the foam slots keep your Romeos and other favorite smokes safe, fresh, and secure. Add a Boveda pack or the humidifying device of your choice to ensure freshness on longer trips and you're all set. Makes a great gift idea, too. Order yours now! AJ Fernandez, maker of Famous Smoke Shop's exclusive Pantheon cigars selection, would be happy to know that you chose this 5-cigar travel case from Xikar. The weather and impact resistant case is airtight and lined with foam slots that keep your favorite smokes safe, fresh, and secure. To ensure your cigars are as fresh as when you plucked them out of your humidor, add a Boveda pack or the humidifying device of your choice and you're all set. Makes a great gift idea, too. Order yours now! Think of this X-treme brand cigar travel humidor as the black box in the cockpit of an airplane. It's virtually indestructible! 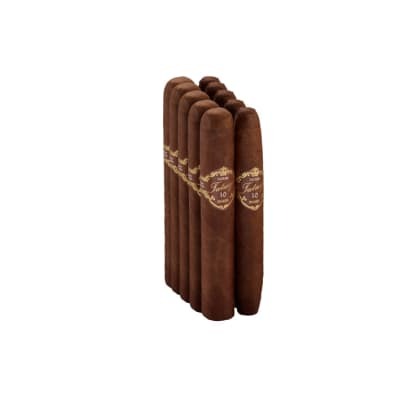 This model securely holds 5 cigars, including wide ring sizes and protects them with thick foam. A humidifier is already mounted under the lid, too. Order yours now! A great cigar travel case for fans of Inferno by Oliva cigars, this 5-cigar model from Xikar is both weather and impact resistant. Lined top and bottom with foam slots, you can keep up to 5 Inferno cigars, or any combination of your favorite smokes safe, fresh, and secure. Add a Boveda pack or the humidifying device of your choice to keep 'em humidor fresh and you're all set. Makes a great gift idea, too. Order yours now! 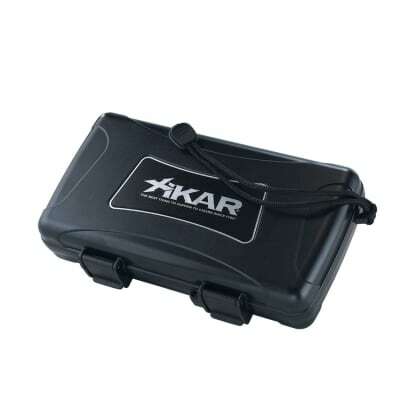 This XIKAR 5 Count cigar humidor is a basic necessity for cigar smokers on the go. Room for 5 cigars (depending on ring gauge) means you get to take a nice selection with you when you're off to your next destination. High impact plastic and foam cradles make this 5 cigar travel humidor easy to pack, and easy to use - it'll be part of your everyday carry gear for sure. Supply your own humidifying device. 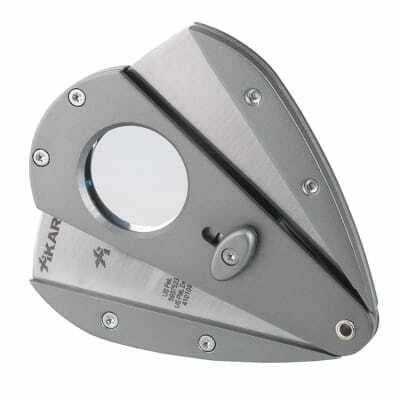 Keep your cigars in tip-top shape until you get where you're going: order your XIKAR 5 Count cigar humidor today! This XIKAR 5 Count cigar humidor BLUE packs the same safety and security features as the original - but this one's Blue, made to be unique...like you. Cigar smokers on the go, keep 5 cigars safe and sound inside a high impact plastic molded case fitted with foam cradles. Add your own humidifying device to keep your cigars ready to smoke for when you arrive. Order this blue XIKAR 5 Count cigar humidor today! Show your devotion for the world's greatest premium cigar discounter with this 5-cigar, weather and impact resistant travel humidor from Xikar which boasts the famous Famous Smoke Shop logo on the cover. 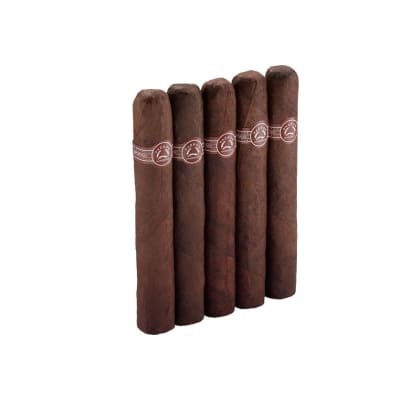 Below decks are cushiony slots (top and bottom) for keeping up to 5 of your favorite cigars safe, fresh, and secure. Add a Boveda pack or a humidifying device of your choice and you're all set. Makes a great gift idea, too. Order yours now! Very solid construction and seal. Keeps your cigars safe and fresh. I had to take out the foam on one side for larger cigars. Fits 4 large cigars comfortably. 5 is a bit too tight for 50 rings. Exactly what I needed and looks great with my other red Xikar accessories. Definitely would recommend! This box holds it all, and is very durable and has a built in hydrometer too. Put a little 50/50 and off you go. This is perfect for the auto or taking with you on hiking trips, water resistance. 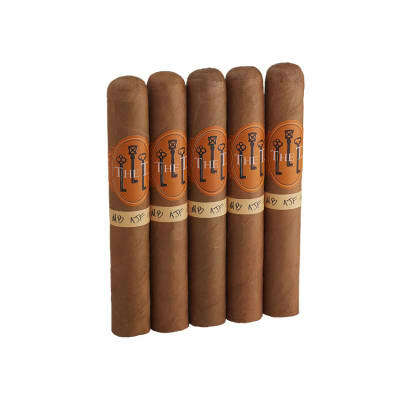 Would not leave out in very hot weather though as heat can build up, and make cigars more moist. For the price from Famous Smokes, you can't find one cheaper.